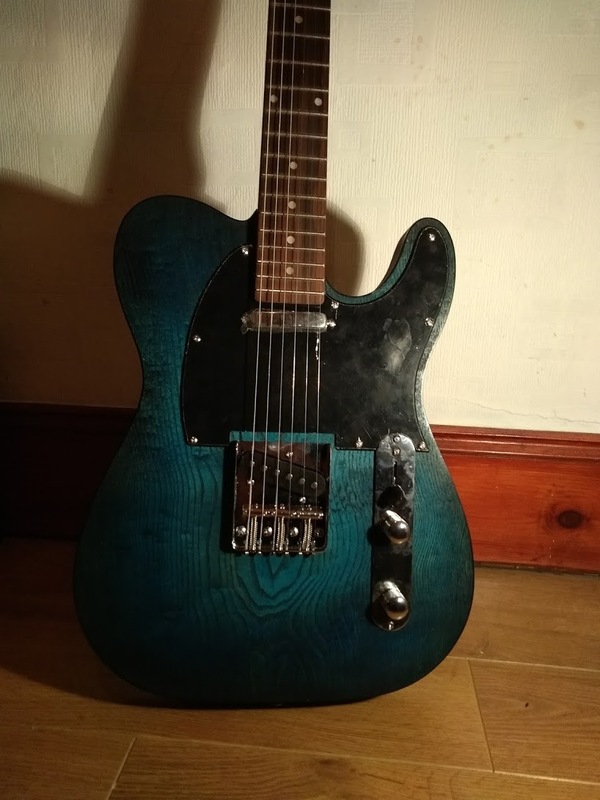 I recently got a Telecaster guitar kit as a present. 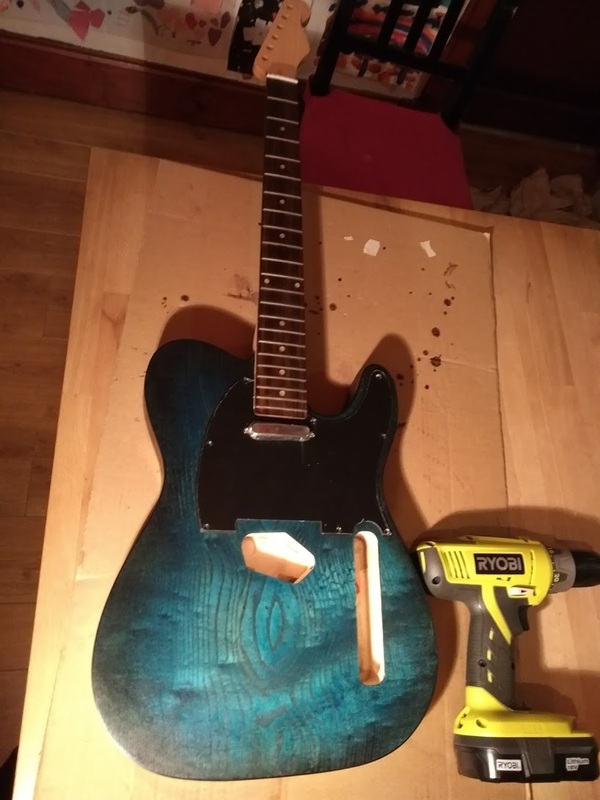 I like guitars, I like building things. Seemed like a fun project. It was pretty cheap for a guitar. Let see what it turns out like after a bit of work. Looks better than I expected. A (quite thin) veneer on the body top, and a black, plastic edge around the front. 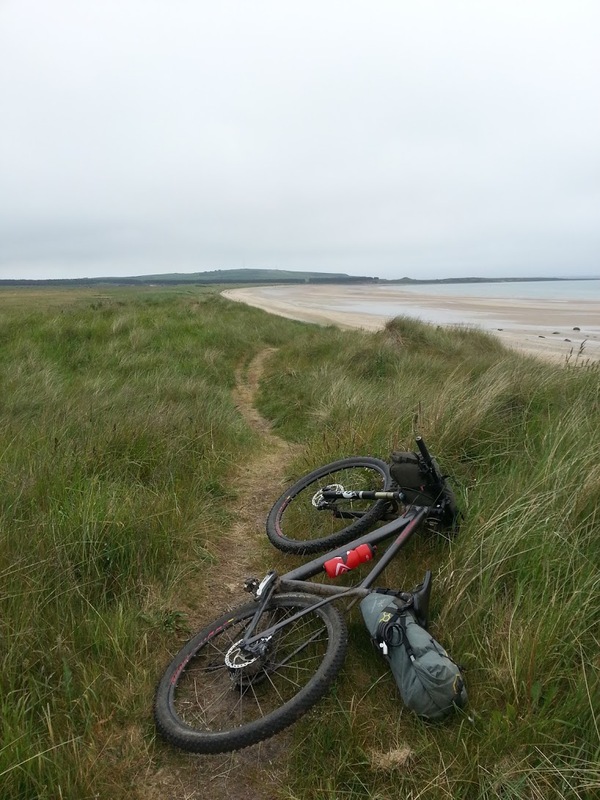 Quite rough in places, and if you want it to be decent than it's going to need a bit of work. 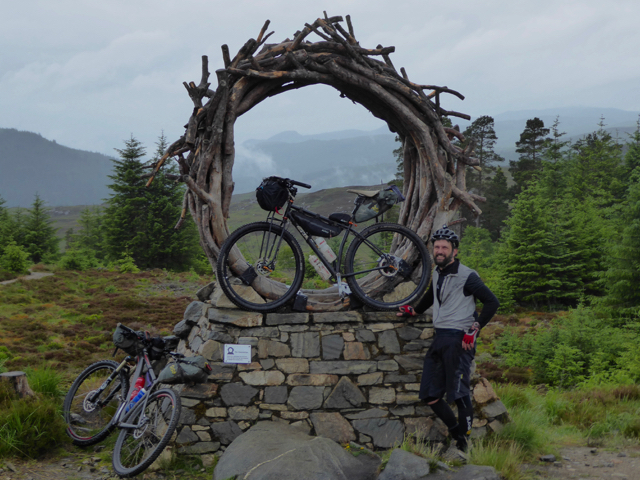 It's not just a case of bolting it together. As expected, the pickups look pretty terrible and are wired up with bad, dry solder joints. Pretty sure the strings that came in the box will also be awful. I spent some time sanding and cleaning up the edges. 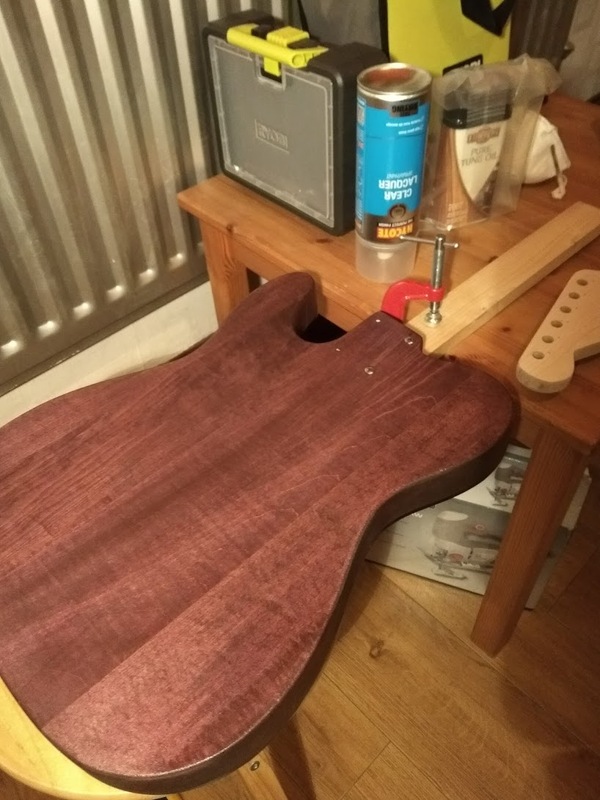 Then I did a test fit of the neck. It was a surprisingly good fit, pretty tight and straight. However, the distance between the top of the body and the surface of the fretboard seemed too much. I checked online and after a bit of searching found the standard height on a telecaster. Mine was 2mm more. This doesn't sound a lot, but I think I'll need to sand the heel of the neck down at a later point to reduce it. Ready to do some work on the body, I taped up the front so I could colour the back. 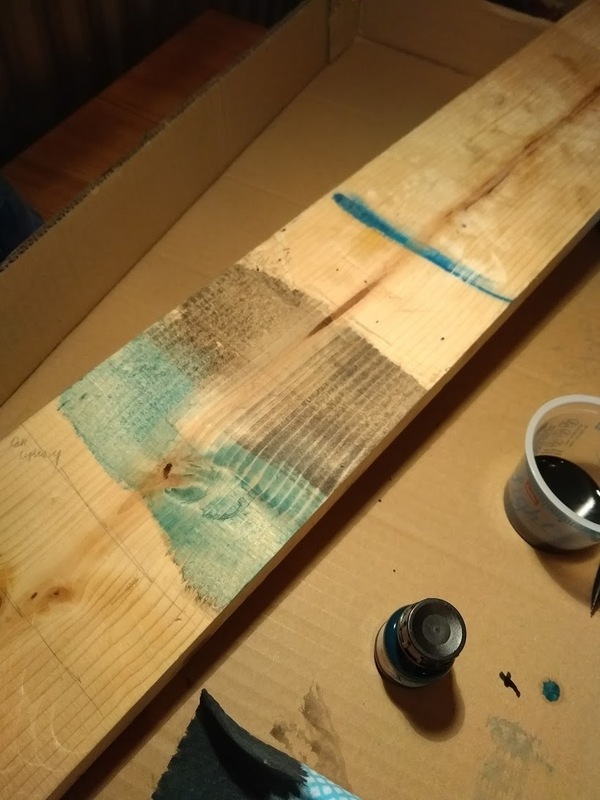 Used an old piece of wood to test my chosen colouring technique. 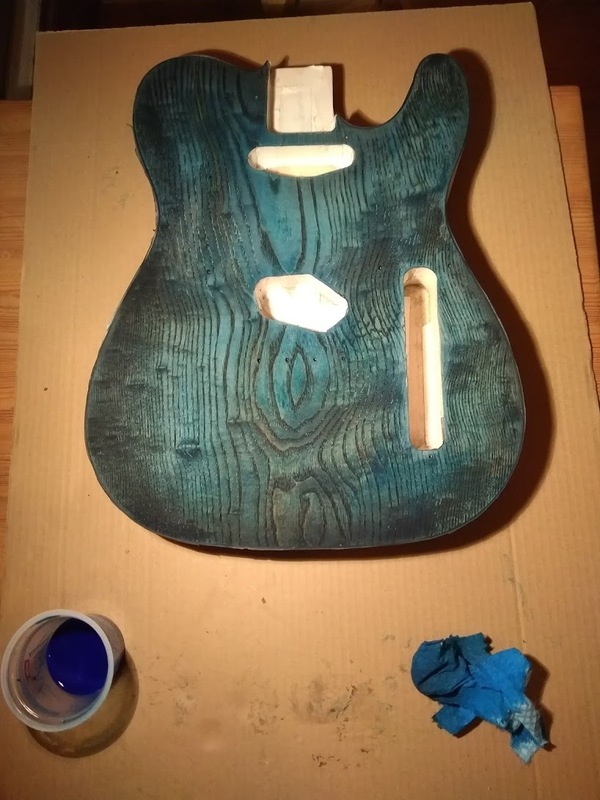 At first I though I'd use solid coloured paint, but the body wood looked nicer than I'd expected, so instead I choose to use water based drawing ink as a stain so that the wood grain would still show through. Decided to make the back purple. Also, there must have been some glue spillage from when they added the black edging as some parts of the wood wouldn't absorb the stain. Some more sanding more or less sorted out these patches. Think it'll look even better once the protective clear coat has been applied. Then it was time to do the front of the body. So I used some diluted black ink here. The idea is that it will bring out the grain. 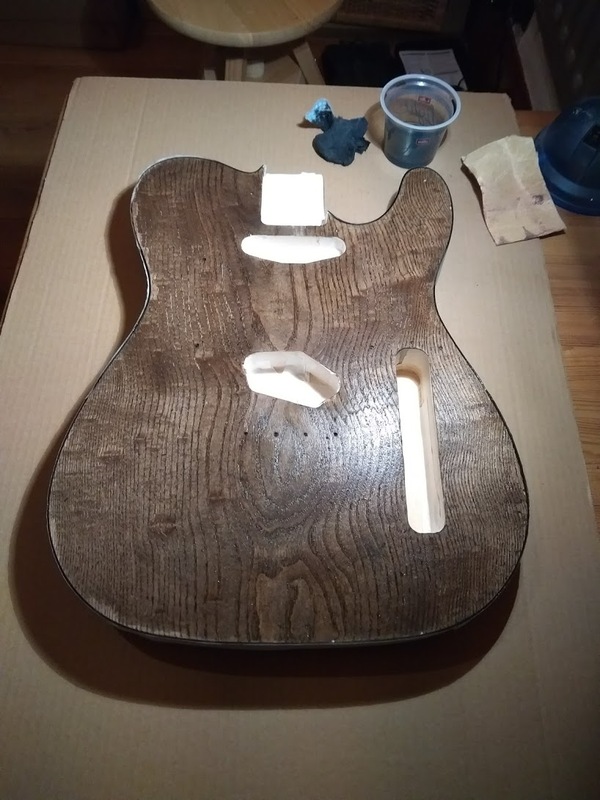 After it dries I planned to sand the surface, hoping the deep grains will retain the black ink, thus allowing them to show through more apparently. Unfortunately, as you can see this showed up more glue on the surface which required a bit of scraping and sanding to fix. 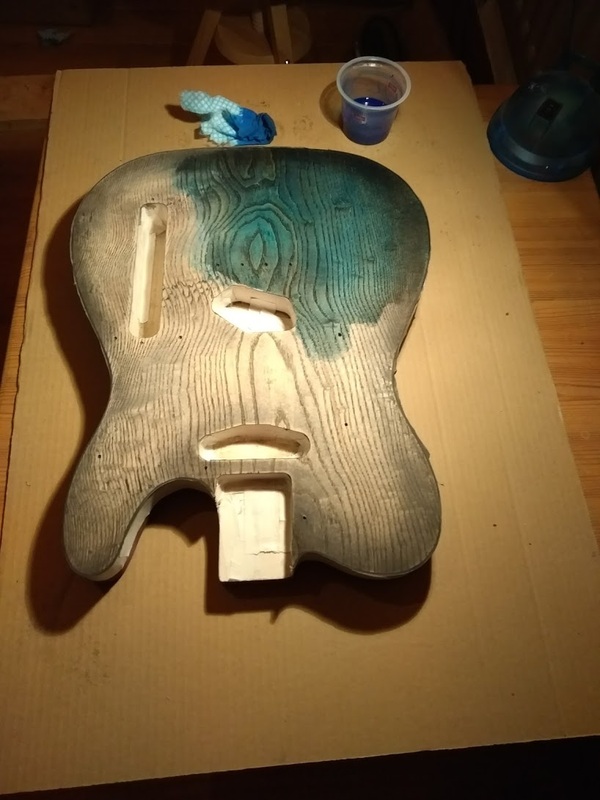 I also sanded more in the centre of the body, leaving it darker at the edges to create a sunburst effect. 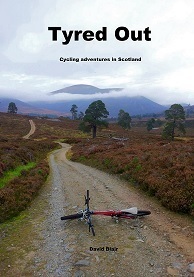 Then it was time to add some colour. At this point it looks terrible, but I just kept going, adding a bit more black around the edges and blending it with more blue. After sanding it down again, concentrating more in the middle to achieve that slight sunburst look, it started to look much nicer. 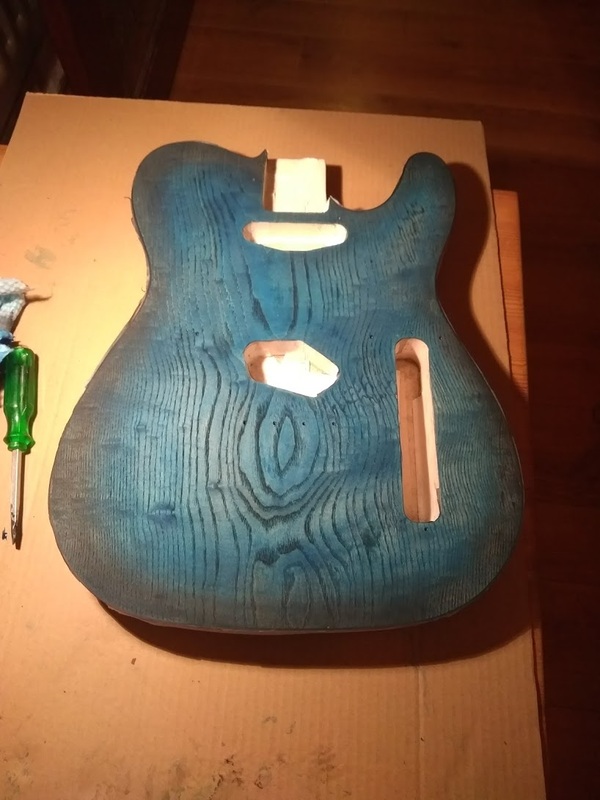 After a bit more work with colouring and sanding, I was pretty happy with the result. Next it was time to protect the body. I choose to use car clear coat, as recommended by others. 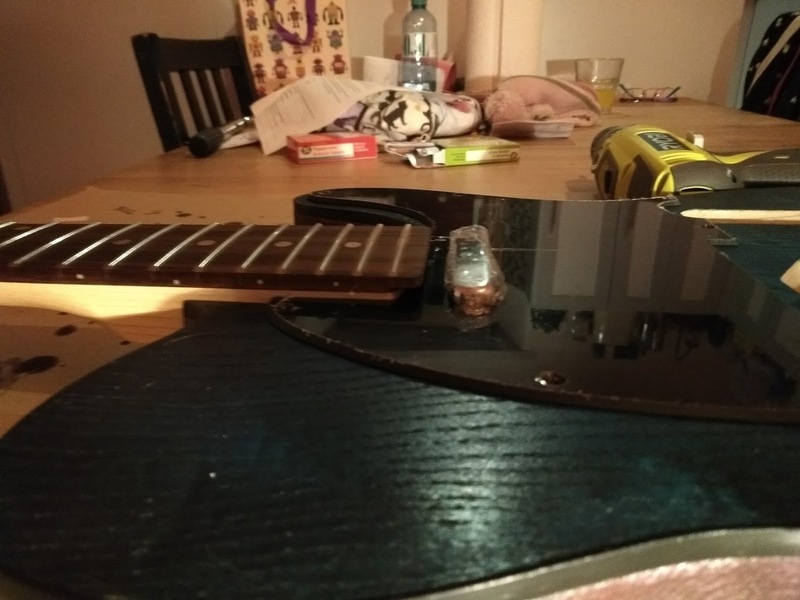 To make this easier and to stop touching of the body after the clear coat was applied, I attached a piece of wood in place of the neck to make a good place to hold the guitar and also to attach it to something while drying. It worked very well! 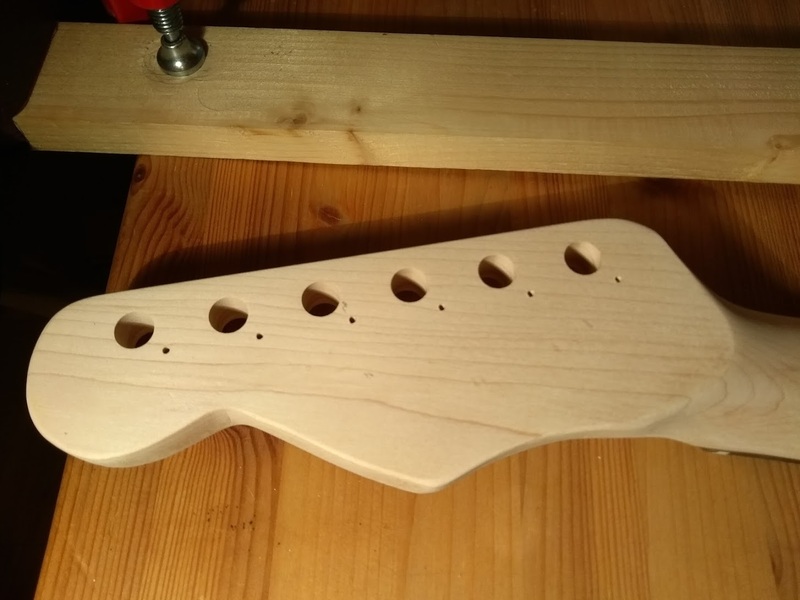 While it was drying, I cut the headstock to shape. 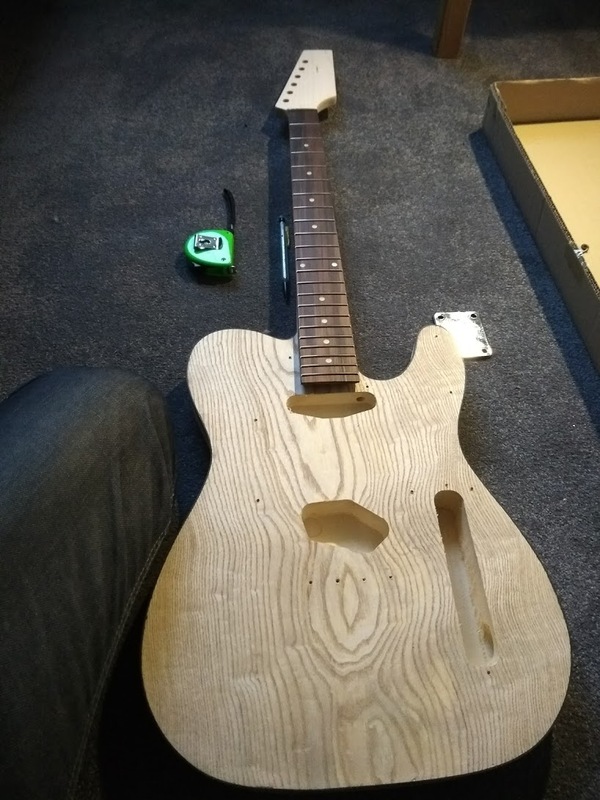 I went for a traditional Telecaster shape. 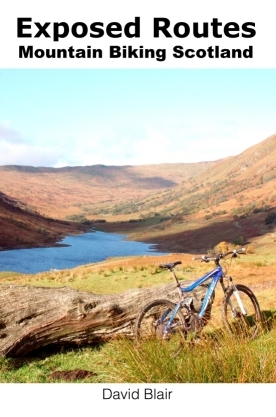 Using a jigsaw made cutting this easy. Then it needed a fair bit of sanding to get it nice and smooth. 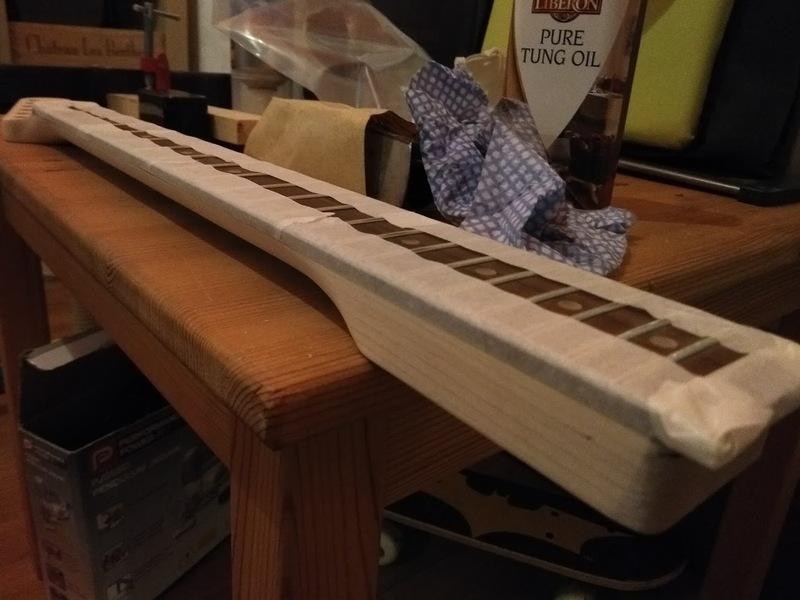 I taped up the rosewood fretboard. 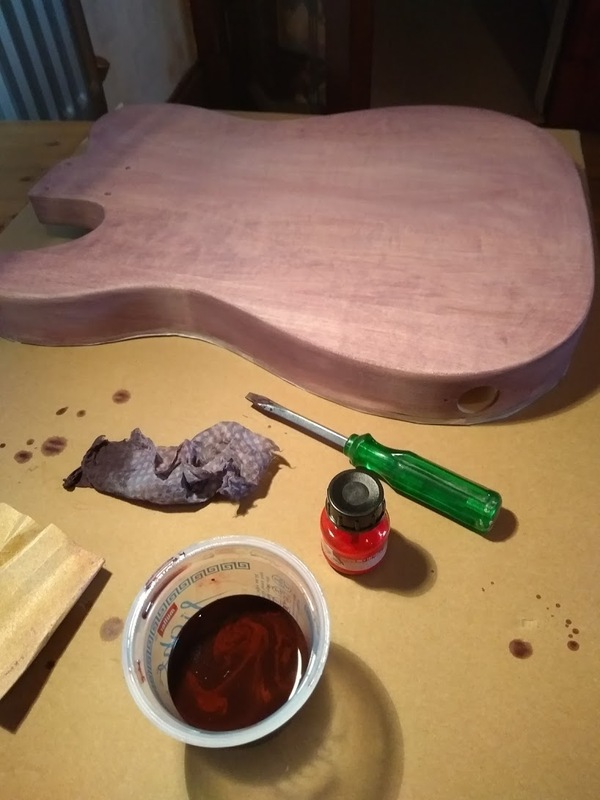 Then I used tung oil on the rest of the neck to protect it while leaving it nice and smooth for playing. I put 3 coats of the oil on, waiting several hours between each and rubbing it in and removing any excess inbetween. 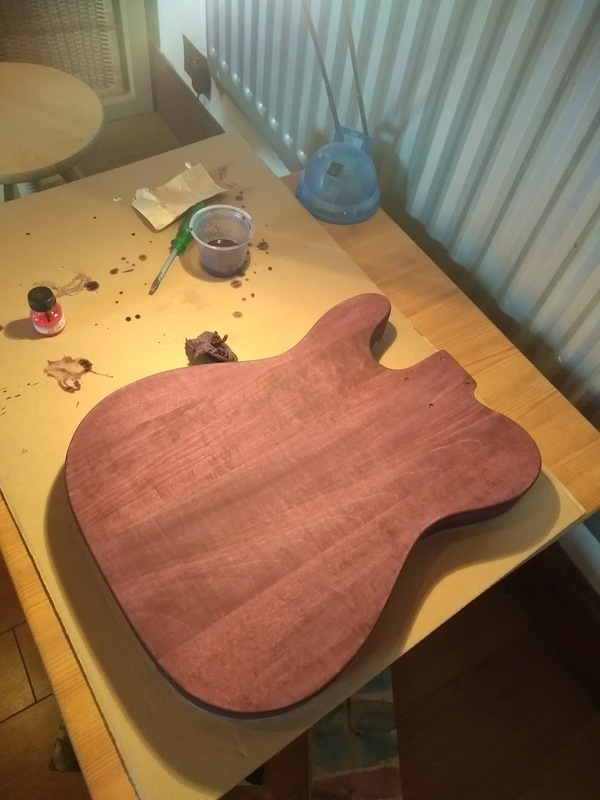 The neck feels great, you can still feel the wood grain, but it's nice a smooth. 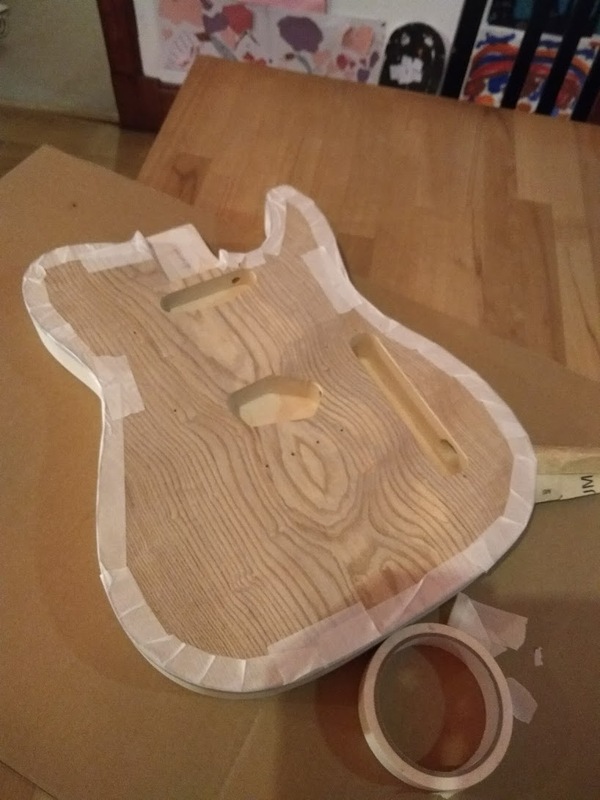 I tested fitting the neck with the pickguard in place. 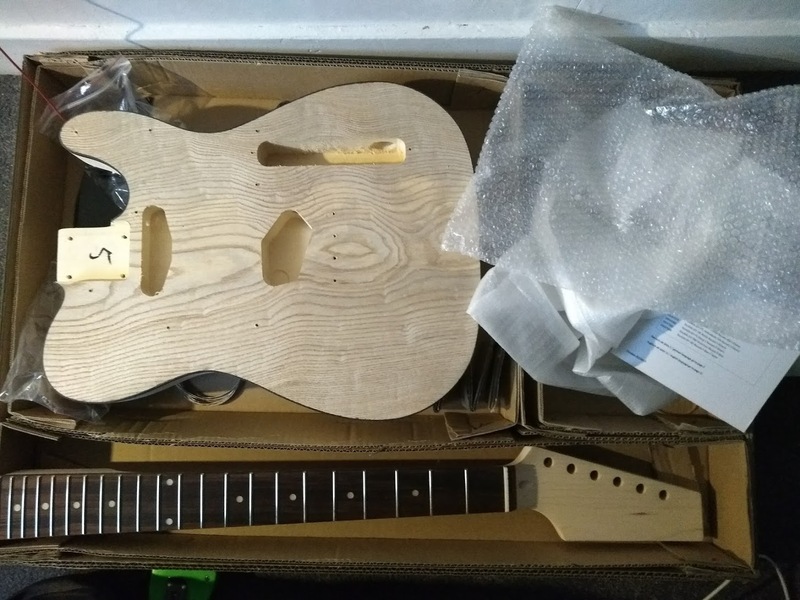 After fitting a couple of the strings at either side, it was clear that the neck was too high at the body. You can see the neck is too high from the side. I had to max out the bridge saddles to lift the stings up. Was way too high for my liking. 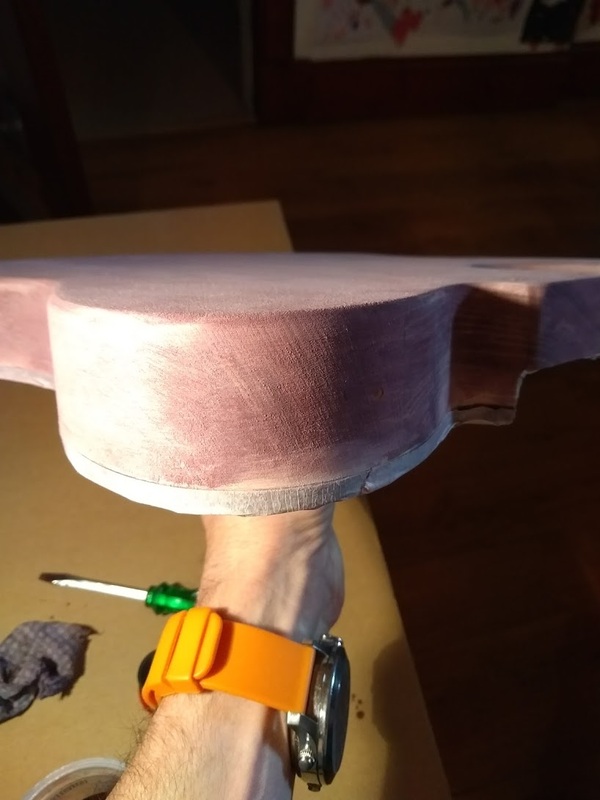 I could have put a shim in at the edge of the neck pocket to tilt the neck, but I choose instead to (very carefully) sand down the neck heel instead. This fixed the issue. And that was pretty much it. I added the tuners to the headstock. Next, I soldered up the kit pickups in the way suggested by some searching online. As part of this I re-soldered the wires onto the pickups as the joints looked terrible. There is still some work to do. I need to get the action slightly lower, though it's not too bad. There's a few rough points on the neck that need looked at (just the edges of the frets can be felt when playing). And I need to sort the intonation and so on. And I may swap out the pickups for better ones. This has been a fun build. I'm pretty happy with the result. The colours of the body have turned out really well. And the guitar is very playable. 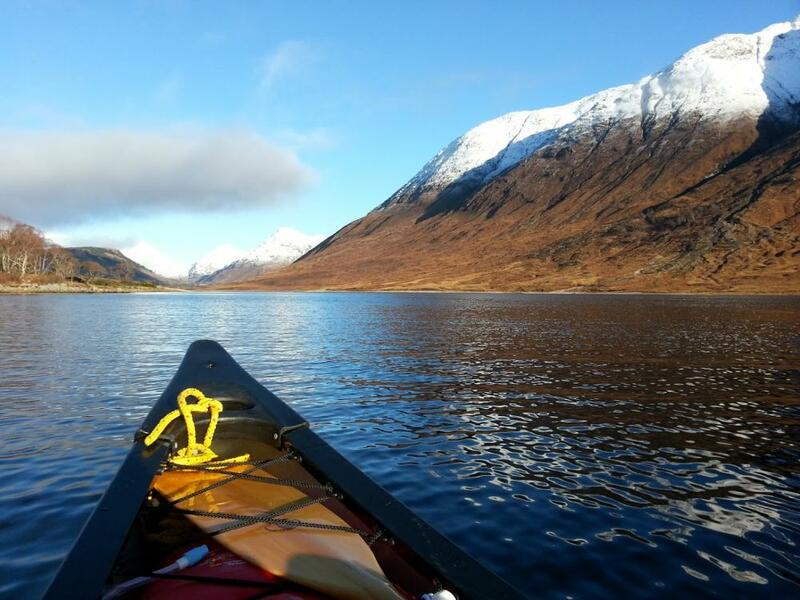 Well worth the work. Now I'm off to learn some Bruce Springsteen songs.